Transforming your home, making it more stylish and attractive, is so easy with new roofline. At Advanced Exterior Plastics, we offer a variety of beautiful fascias, soffits and guttering to complete your home improvements. 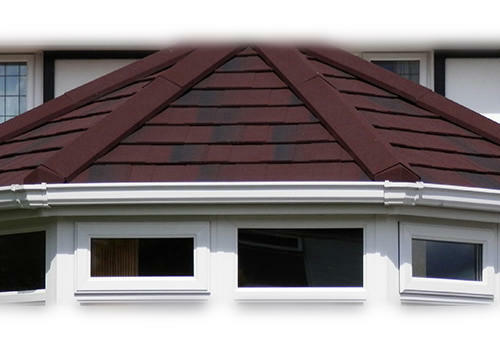 Our roofline is superb, offering a beautiful finish and great protection from the elements for your home. If you are looking for a clean, fresh style for your Romsey home, then fascias, soffits and guttering from Advanced Exterior Plastics is the perfect solution. We offer expert installation and outstanding customer services, making us the go-to company for your home improvements. Read on to find out more about our incredible roofline products. Our uPVC roofline is simply superb. It is manufactured from high grade plastic, making it hard wearing and long lasting too. It features the latest innovations to ensure it is a practical as well as a stylish solution, and it will help to protect your home against even the worst of the British weather. We offer a complete range of products, enabling you to get a beautifully matched look for your home. Our fascias, soffits and guttering are also tailored to your tastes with a range of lovely colours to choose from. You can complement the style of your architecture with ease when you choose your roofline from us. Expertly installed, your new fascias, soffits and guttering will last the test of time, making it a cost effective solution for your home improvements. We offer great prices on our roofline in Romsey, giving you fantastic value for money. Not only that, but new fascias, soffits and guttering could be one of the most cost effective home improvements you ever make. If your roofline is damaged or not performing at its best, then it could result in damp issues, rotten timbers and expensive remedial work. When we install your new fascias, soffits and guttering, we will inspect your cavities for any damage and advise you of the best solution to repair. We will never simply cover up issues, ensuring that when we install your roofline, you can be confident that your home is secure against the elements. Find out how much our fascias, soffits and guttering will cost for your home. Simply contact us and our friendly team will be happy to help with quotes and expert advice. If you prefer, why not book an appointment and we will visit you, with no hard sell either, just a chat about your requirements over a cuppa. Fascias are the boards which run along the edge of your roof. They are the stop for the tiles on your roof and they support the guttering. High quality fascias are a vital part of your roofline, as they help to stop water ingress and they carry vast amounts of water weight year after year. Fascias may seem like a simple part of your roofline, but in fact, they perform a variety of roles to keep your home safe and secure. Soffits are the section of your roofline which is most easily seen from the ground. Soffits tend to be ventilated, allowing air to circulate within your roof space. This is an essential feature, as it helps to eliminate damp, protecting your timber roof joists. Soffits also give the neat finish to your home that passers-by notice, adding to its kerb appeal and making it more attractive. Guttering collects the rain which runs off your roof during inclement weather, allowing it to safely flow away from your home. Cracked, leaking guttering will make your walls wet, and could lead to issues which require expensive and disruptive building work to repair. Quality guttering needs to be robust and durable, as an average three-bedroomed semi-detached home receiving just one inch of rain, 500 gallons of water will flow through the gutters. Advanced Exterior Plastics are dedicated to offering the most competitive prices for fascias, soffits and guttering throughout Romspey. For your free, no obligation quote please get in touch with one of our team members today. Advanced Exterior Plastics Ltd offers a full range of roofline products, in order to protect your home from the corrosive and harmful weather conditions. Ensuring your Southampton roof is protected is vitally important, especially for the approaching colder months which will bring the rain and damp. Throughout this article, we’ll look at why more and more homeowners are realising just how important quality roofline protection is. Further to this, we’ll tell you a little about Advanced Exterior Plastics Ltd and the work that we do. Advanced Exterior Plastics Ltd are based in Eastleigh, near Southampton in Hampshire. Our team is made of professional home improvement experts, each member trained to the highest standards. Throughout our time in the industry, we have gained invaluable accreditations – highlighting us as one of the most trusted and experienced home improvement companies in Eastleigh and Southampton. Why Invest in New Roofline Products? Protecting your Southampton roof is of the utmost importance. Preventing the need for technical and costly repair work. Advanced Exterior Plastics offer a superb range of quality fascias, soffits and guttering systems suitable for all homes. Our team has received the highest levels of training and can offer bespoke roofline solutions suitable for all homes. Advanced Exterior Plastics use the highest quality soffits, fascias and guttering when replacing or working on a new roofline system for Southampton homes. All of our systems are specially treated to withstand the worst of British weather, and to reduce blocking. 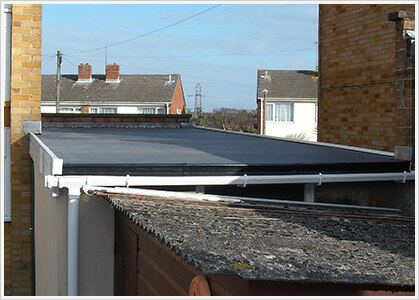 Meaning waste water is controlled, and your roof is protected. Advanced Exterior Plastics offer our roofline solution, including our full supply and fit service of fascias, soffits and guttering throughout Southampton, Eastleigh, Winchester, Romsey and the surrounding Hampshire towns. We do offer our services outside of these areas, depending on the requirements of the project. Speak to us today to find out if we offer work in your area. Reach us on 02380 692447, we look forward to your call. Fascias – Fascias work exceptionally hard to protect your primary roof support systems, including the wooden rafters. The somewhat unpredictable British weather can severely damage traditional roof support systems, if left exposed to the elements. Our fascias prevent the need for expensive roof repairs. Soffits – Soffits give your Southampton home a squeaky clean appearance and cleverly conceal the gap between the fascias and the side of your Bournemouth home. To ensure they blend in and match the existing aesthetics of your property, our soffits are available in an exciting range of colours and finished. Guttering – The most recognisable part of a roofline system, guttering channels waste water from the roof of your home to the surrounding drains. Throughout our years in home improvements, our team has worked exceptionally hard to connect with influential and respectful bodies in the industry. Separating us from local competition and highlighting Advanced Exterior Plastics as one of the most reliable and professional home improvement specialists throughout Bournemouth, Eastleigh and Southampton. FENSA – Advanced Exterior Plastics are a FENSA approved installer, industry standard for double glazing and home improvements; issuing FENSA approved certificates after all work has been completed. FENSA rightly set the standards high, providing a platform for quality control for homeowners and tradespeople alike right across the country. Which Trusted Trader – Arguably the most accepted and respected name in consumer testing, Which Trusted Trader provides a platform for the public to leave honest and open reviews about their experiences with us. If you are considering using our services for your home renovations and property developments, browse our reviews first. Checkatrade – An established household name for homeowners throughout the UK, Checkatrade has helped force the Cowboys out of the home improvements industry for years. We are full vetted members of Checkatrade, please see our reviews for more information. Advanced Exterior Plastics offer the most competitive fascias, soffits and guttering prices throughout Hampshire. For your free no obligation quote please use our contact page. If you require further details about our roofline or any other of our products, please do not hesitate to get in touch with one of our friendly and professional team members. We are more than happy to answer any questions you have. It is vitally important to look after your roofline products. They are exposed to harsh temperatures and all manner of bad weather. This is why Advanced Exterior Plastic’s fascias, soffits and guttering is so popular in Eastleigh. Our wide range of fascias, soffits and guttering has been designed to withstand the elements meaning it will not rot or warp. Made from high-quality uPVC you know that it is built to last. Any of the products in our range of fascias, soffits and guttering will add a sleek and stylish finish to the exterior of your property as well as be extremely efficient at its job. We offer a wide range of fascias, soffits and guttering available in Eastleigh. We offer a selection because we know that everyone has different needs and every property is different. Because of the selection, we offer our fascias, soffits and guttering can blend seamlessly onto any property. This means regardless of whether your home is a traditional home or a more contemporary property we have fascias, soffits and guttering for you. Our roofline product designs are made to benefit our customers by giving them products designed with our years of experience in mind. While all of our roofline products are designed to be aesthetically pleasing there are also many other benefits to be enjoyed. We can assure you of the high level of quality of all of our fascias, soffits and guttering. There is a reason our roofline products are so popular in the Eastleigh area. They are designed with your needs in mind. You need durability and style. All of our roofline products are extremely effective in both areas. The uPVC we use in our roofline products are perfect for fascias, soffits and guttering, as they can be made in different styles and are extremely durable. Unlike other materials, it will not discolour, rot or warp making it the perfect material for roofline products. The reason our fascias, soffits and guttering is so popular in Eastleigh is the cost-effectiveness of our products. We take great pride in our high-quality products and make sure that they are durable and built to last. This is what makes our roofline products so cost effective as not only do you receive high-quality products and a speedy installation but all of our fascias, soffits and guttering will last. This sadly is not the case with all fascias, soffits and guttering but that is what makes Advanced Exterior Plastic’s roofline products superior. All of our manufacturers and fitters are experts in their field, they truly do know their craft and enjoy it, which is clear from their finished work. It is thanks to our expert team that we have been so highly endorsed by so many companies. ew left on Checkatrade by a customer in Eastleigh who needed a replacement fascias, soffits and guttering they said: “Excellent workmanship. No hard sell”. Because of our highly qualified and experienced team of experts, we can assure fast installation. We do not wish to inconvenience you and try to get all work done as quickly as possible while maintaining our usual high level of standards. This is even more impressive when you consider that not only can we produce and install such great quality roofline products to such high standards but we can install them so quickly. We believe our customer service to be second to none. We try to build a rapport with our customers to truly understand their needs, this shows a level of respect. Because we do respect our customers. We do not, like some companies, belittle our customers as they are not as familiar with the process of installing fascias, soffits and guttering. We also never use the hard sell, this is another practice that we do not tolerate, that is why we believe our customer services are second to none. To purchase any of our fascias, soffits and guttering products contact us, you can simply head over to our easy to use the online quoting engine. Which will give you a reliable estimation on the price of our roofline products meaning you’ll be able to find a price that suits you in a prompt and efficient way. Alternatively, if you feel you need more information you can simply get in touch with us via our online contact form to speak to a member of our friendly team who is always on hand to help. If you are looking for a way to create a fluid transition between your home and your garden, Advanced Exterior Plastics has a solution for you. Our aluminium bi-folding doors are an ideal choice for any property. Whether you live in a modern, contemporary space or a traditional home, our bi-folding doors are the perfect choice for you. Providing a huge range of colours and hardware options, these doors can be fully tailored to your specifications. We strive to create aluminium bi-folding doors that offer the absolute best in performance. Our doors are secure, thermally efficient and durable and will be a practical and stylish option for your Eastleigh property. We have carefully taken the step to divide up your options into a neat guide about our aluminium bi-folding doors in Eastleigh. A hugely popular choice in Eastleigh, aluminium bi-folding doors maintains the absolute best in practicality and style. Opening neatly to one side, you are left with a wide open space, which truly blurs the line between home and garden. It also means that these doors do not take up any extra space when opened, which creates a match for homes where it is necessary to be more economical with space. Extremely aesthetically pleasing, the aluminium frames are naturally robust to allow usage of scarcely thin frames. This provides you with beautifully slim sightlines for unbeatable views and a huge influx of natural light. Natural light has the effect of making a home look more spacious, so these doors will open your home up in more ways than one. Featuring a top of the range thermally broken profile, these aluminium bi-folding doors offer incredible energy efficiency for your home. As warm air is kept inside your home and cold air cannot penetrate the frames, your home remains warm and comfortable all year around. This is a highly effective way to save money on the running costs of your Eastleigh home while reducing your carbon emissions. As your home retains heat so well, you will rely a lot less heavily on your heating system during the cold British winter. This means you will see significant savings on your heating bills. 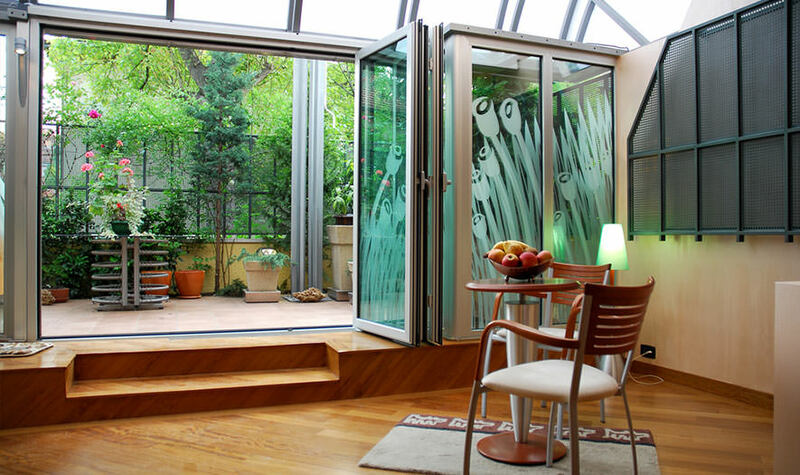 These aluminium bi-folding doors are an investment that saves money in the long term. Aluminium is also an extremely widely recycled metal. This means that our aluminium bi-folding doors are an inherently environmentally sustainable choice. 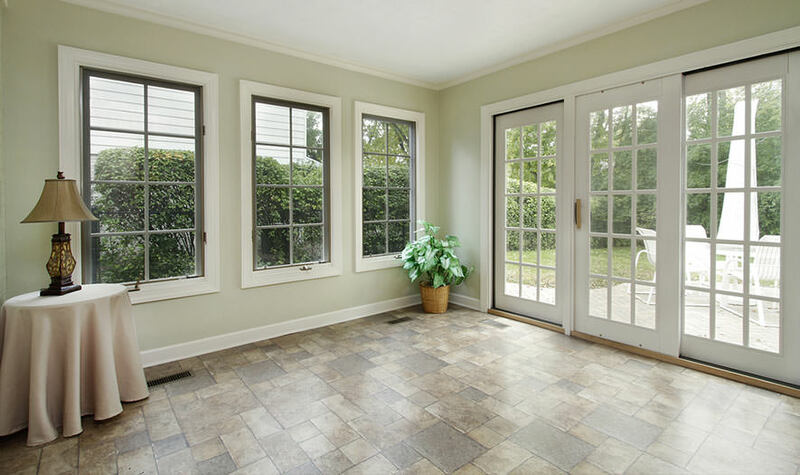 Make your home greener with doors from Advanced Exterior Plastics. Aluminium is an extremely popular choice of double glazing material in Eastleigh, due greatly to its security. As aluminium is naturally robust and firm, these doors will stand up extremely well to sustained physical attack. We also provide state of the art multipoint locking systems from Ultion, as standard, for all of our aluminium bi-folding doors. When it comes to high quality home security, Ultion is a market-leader. This adds an extra layer of protection to your home to offer you supreme peace of mind. Just relax with the knowledge that Advanced Exterior Plastics has your safety in mind. Our aluminium bi-folding doors are available in a comprehensive range of colours. No matter the style you wish to achieve for your home, Advanced Exterior Plastics can help you attain it. We also offer a range of hardware options that are both decorative and practical, so you can create a door that is truly bespoke to your Eastleigh home. In addition to this, our aluminium bi-folding doors are available with a number of opening configurations and a customisable number of panels. This means regardless your property’s dimensions, you can tailor your new aluminium bi-folding doors to fit. If you would like any further information about our aluminium bi-folding doors in Eastleigh, or any of our other products, please do not hesitate to contact us, as our team is highly skilled and experienced and will be on hand to answer any questions you may have and provide you with as much information as you want. 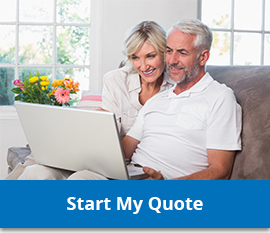 Alternatively, if you would prefer, we offer an online quoting engine that will provide you with a free and instant quote for our products. Our prices are highly competitive and your quote will be specifically tailored to your tastes and the dimensions of your home. When you use our quoting system, we do not place you under any obligation to buy. Replacing your windows with quality new uPVC windows will completely refresh your Romsey home, both in appearance and in performance. Old and tired double glazing very often provides poor efficiency and security, as they are weak and dated. With modern uPVC windows, you can expect outstanding thermal performance and home protection. Here at Advanced Exterior Plastics, we supply and fit state of the art uPVC windows throughout Romsey. They come in a range of styles to complement any property, from traditional to contemporary. Our uPVC windows in Romsey are exceptional; read on to see the features and benefits they offer for your home improvements. We work with the cutting edge Duraflex range of uPVC windows, as these windows excel, especially when it comes to thermal performance. They have an integrated Q-Lon weatherseal. This is a sheathed composite gasket and it works to provide brilliant protection against the cold and the elements, keeping your home warm and dry. Our uPVC windows in Romsey are so superb when it comes to energy efficiency, they are even capable of the highest levels of Window Energy Ratings. This means that not only will you feel the benefit they offer as soon as they are installed, but you will also see it in no time at all too. 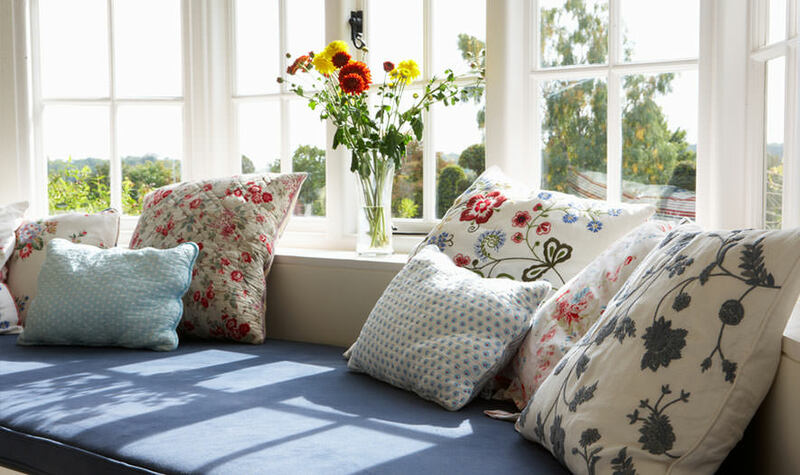 Our windows will keep your home warmer for longer, and so you will use less heating. The result of this of course, is lower energy bills, making these double glazed windows brilliantly cost effective. Protecting your home is an important consideration when looking at replacement double glazing. It is one of the essential functions your new windows will need to provide. Our uPVC windows in Romsey are a great choice for keeping your property and family safe and secure. They feature the latest innovations in double glazing to ensure they are super strong, and we complement this by fitting them with high security locks. Our advanced locking systems will ensure that your windows will withstand even the most determined potential intruder. These high quality windows are even internally glazed for additional security. To ensure maximum protection, our uPVC windows are manufactured to the specifications set out by Secured by Design, the police initiative for secure double glazing. When you choose Advanced Exterior Plastics for your double glazing installation, you will benefit from superb style. Our uPVC windows are tailored to suit your tastes and to complement your property. You can choose from a wide range of finishes, including standard woodgrain, premium woodgrain and solid colour foils. We work with ultramodern foils that are 100% calcium organic material and are applied using an eco-friendly process. You can be confident that no matter which option you choose, you are being kind to the environment. We also offer glazing options and hardware choices, enabling you to create the perfect style for your home. Casement Windows – Beautiful in their simplicity, the casement window is an absolute classic. These highly versatile windows can complement the character of traditional properties and the sleek aesthetics of modern homes with ease. A highly popular home improvement. Sliding Sash Windows – Our sliding sash windows are the ultimate choice for when you need double glazing that blends in with period features and adds to the heritage style of your home. These stunning windows feature durable technology for smooth operation. Tilt and Turn Windows – When you need windows for safe ventilation, easy access and a stylish look, our tilt and turn windows are ideal. They have a stunning slim design that creates lovely, extensive views and yet they are highly functional. uPVC windows prices in Romsey need not be unaffordable. With Advanced Exterior Plastics, you can expect outstanding quality, combined with cost effective prices that offer fantastic value for money. Our quotes are tailored to you to ensure that you only pay for the exact uPVC windows that you choose. They are based on several variants such as size, design and enhancements. This means that you can create a quote that is perfect, offering both the style and design you want as well as a price that suits your budget. Visit our online window designer and choose from the options available to create the exact windows that meet your every requirement, including cost. Or, you can get in touch with our team and we will help you with finding your ideal uPVC windows in Romsey. Double glazing in Romsey can completely transform your home. You can benefit from improved efficiency, enhanced security as well as a more appealing appearance. With new double glazing, there are endless benefits, and all for a superbly cost effective price. Advanced Exterior Plastics offer a wide range of double glazing options too, so choosing us as your installers will mean you can find your perfect match. Our installation engineers are trained to the highest standards, and our double glazing offers impressive quality. Why not upgrade your Romsey property with new double glazing? Read on to discover why it’s such a great home improvement. One of the main reasons that Advanced Exterior Plastics is such a sought after double glazing installer in Romsey is due to the choice that we offer our customers. You can opt for windows, doors, conservatories, and roofline. Today, we are going to talk about our windows and doors and help you learn more about the benefits and features they offer. You can choose from uPVC products, including composite doors, as well as traditional wooden designs to find the best double glazing for your home. First, we’ll take a look at our uPVC windows and doors. Replacement double glazing is very popular and people often prefer uPVC to other materials for a number of reasons. uPVC windows and doors offer great value for money. They also come in a wide range of styles and are high performance products. Our uPVC collection is manufactured by Duraflex which ensures your double glazing will meet the highest standards. 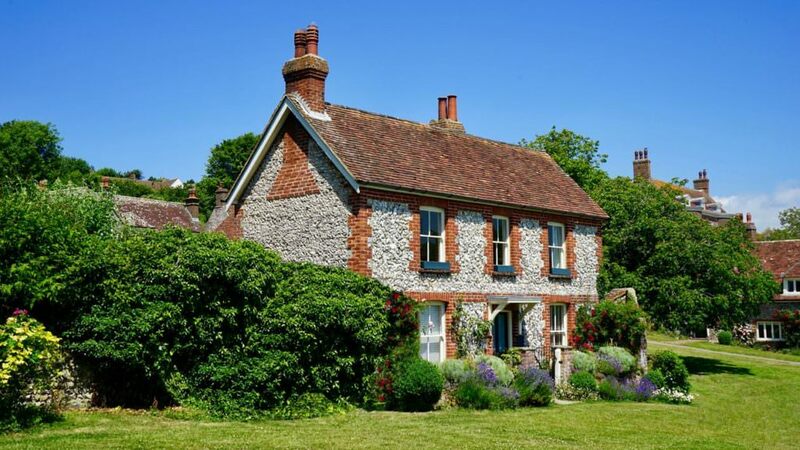 It is expected that new double glazing will keep your Romsey home warm, however, with our uPVC windows and doors, you will benefit from the most outstanding thermal performance. These windows and doors are capable of the very highest Windows Energy Ratings, making sure that no matter how cold the winter gets, your home will be cosy and comfortable. This is through the innovative pre-inserted Q-Lon weatherseal. This clever technology is a sheathed composite gasket and it works to create high thermal efficiency. In fact, with such exceptional energy efficiency, you could find you are using less heating and as such, are saving on your energy costs! When it comes to security, there is nothing that competes at the same standards as our uPVC windows and doors. Our complete range is capable of meeting the standards of Secured by Design [link]. This police initiative sets the highest standards for security performance. With our windows and doors, you can have complete peace of mind that your home and family are safe and secure. We offer a stunning range of foil finishes for your new uPVC windows and doors, which are not only beautiful, but eco-friendly too. Our foil finishes are made from 100% calcium organic material and are applied using an environmentally friendly process. We offer a range of colours to choose from, including standard and premium woodgrain as well as solid colours. Our uPVC windows come in three distinct styles, so that whatever type of home you have, you can benefit from aesthetics that enhance its character. 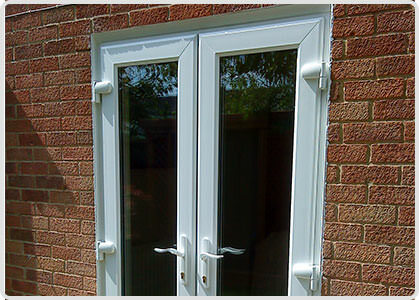 Our uPVC doors are a practical home improvement. We can replace old doors or even create new entrances within your property. For more traditional double glazing in Romsey, we also offer a range of superior wooden windows and doors to our customers. These state of the art timber designs are crafted by experts, who have many years of experience, ensuring outstanding quality. Every window is created to be bespoke to you and your home, making them a luxury home improvement. With our wooden windows and doors, gone are the days when you needed to commit to long term, high maintenance, as our double glazing features the latest developments to ensure it requires little effort to keep it in perfect condition. These stylish double glazing options are also incredibly insulating, protecting you from the cold as well as the wind and rain. They will even provide you with a quieter home to enjoy as they provide a superb sound proofing performance. Timber windows and doors from Advanced Exterior Plastics are ideal for any Romsey home and will keep you safe and secure as well as add charm and an element of high end beauty. 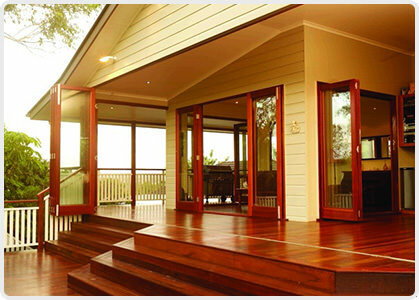 Find out more on our wooden windows and doors pages. Our double glazing prices in Romsey are exceptional, making your home improvements great value for money. Get an instant double glazing quote online or contact us and our friendly team will provide you with expert advice and guidance on your Romsey home improvements. uPVC tilt and turn windows are so versatile, they are the ideal choice for any Eastleigh home improvements. They can be tailored to blend in with your property’s style and they have several innovative features that make them one of the most technologically advanced windows on the market. With uPVC tilt and turn windows, your home will be safer, more secure, easier to manage and high performance. These stylish windows are a complete revolution in double glazing and will truly enhance your Eastleigh property. Here at Advanced Exterior Plastics, we offer our Eastleigh customers state of the art uPVC tilt and turn windows, that are a popular choice from our windows range. These quality double glazed windows will transform your home, making them a fantastic option for both home improvements and new builds. Read our handy guide to uPVC tilt and turn windows in Eastleigh and see how you can benefit from this superb double glazing. Whether you are looking for windows to finish a new build project or for replacement windows on a refurbishment or renovation, our Duraflex uPVC tilt and turn windows make a great choice. They are so versatile and can be adapted with Georgian or astragal bars to create a traditional appearance, or with plain glazing for a modern and sleek look. Our expert installers will take the utmost care to ensure your uPVC tilt and turn windows are fitted perfectly, upgrading the style and performance of your Eastleigh property. Our uPVC tilt and turn windows are superb when it comes to thermal performance. Your Eastleigh home will benefit from superior double glazing combined with advanced technology. These high-performance windows are fitted with a Duralite Warm Edge Spacer bar. This innovative design is up to 22 times more energy efficient than a standard aluminium spacer. It helps to ensure that heat cannot escape your property. In addition to this, our uPVC tilt and turn windows in Eastleigh are engineered with a multi-chambered profile. This clever technology creates a thermal barrier which eliminates draughts and works along side the spacer to keep warmth within your home. Our windows are spectacular when it comes to thermal performance, and we offer a range of options so that you can achieve a Windows Energy Rating to best suit your property. 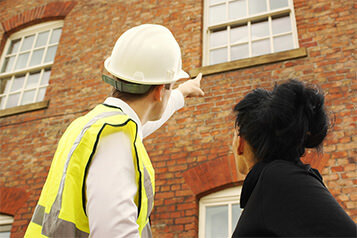 We offer A, B and C rated windows to ensure every customer’s needs are met. Safe ventilation is an important feature of our uPVC tilt and turn windows, making them the perfect option for upper floors, high-rise properties and families with young children and pets in Eastleigh. The intelligent design means that the window can be safely locked in the tilt position, allowing fresh air to enter your home, while vulnerable family members are unable to come to harm. The operation for this is so simple too, with a click and twist of the handle, you can go from safe ventilation to opening the window to its full extent. The wide opening that our uPVC tilt and turn windows provide can be used as emergency exits when installed correctly, even being approved by Building Regulations. With uPVC tilt and turn windows in Eastleigh, you can have peace of mind that you and your family are safe and secure. Our uPVC tilt and turn windows can be tailored in so many ways to ensure they are the perfect match for your Eastleigh home. You can choose from a variety of colour finishes, each one as beautiful as the last. Perhaps you would prefer an authentic and natural woodgrain appearance, ideal for period homes, blending in with the traditional style. Of course, we also offer our uPVC tilt and turn windows in fresh, clean white, ideal for complementing modern properties. There are featured or bevelled options for the profiles, and decorative glazing is available for extra privacy. performance. Contact us for your free uPVC tilt and turn window quote. Why Choose uPVC Casement Windows in Eastleigh? uPVC casement windows are an incredibly popular option when it comes to new double glazing in Eastleigh, but why should you choose them for your home? Advanced Exterior Plastics offer a great uPVC casement window for your Eastleigh home improvements, so we wanted to explore the reasons behind why choosing these windows is a great way to go. uPVC casement windows have an extensive history as a window design, making them one of the window styles that you see across Eastleigh and the surrounding areas. Let us tell you more about these brilliant windows and why they could be the right choice for your home. uPVC casement windows are one of the most versatile window designs in the industry, as they can work with the style of any property. 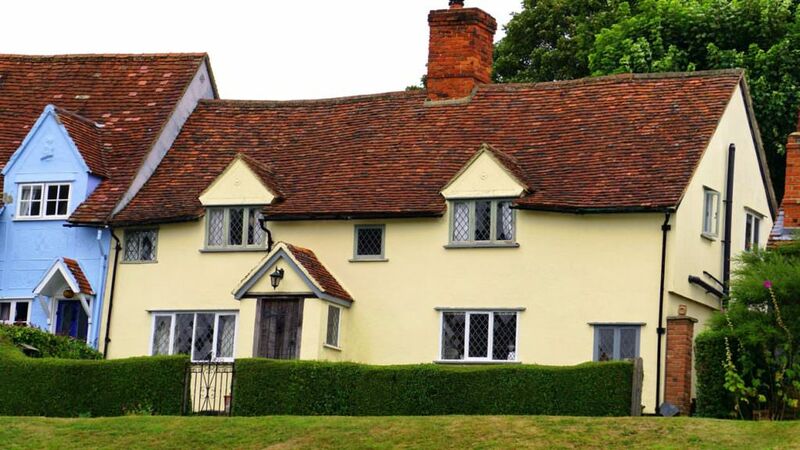 The original casement window design was first introduced in the 1600s, so they are a great choice for period homes. With modern innovations and technology, uPVC casement windows have taken this traditional appearance and brought it into the 21st Century. uPVC casement windows have a timeless aesthetic, that really does blend in with any type of property, from older homes to new builds. The style is sophisticated and minimalist, and can be adapted to offer authentic traditional features or incredibly modern streamlined looks. Here at Advanced Exterior Plastics, we work with Duraflex to ensure that our customers benefit from state of the art design and manufacture. 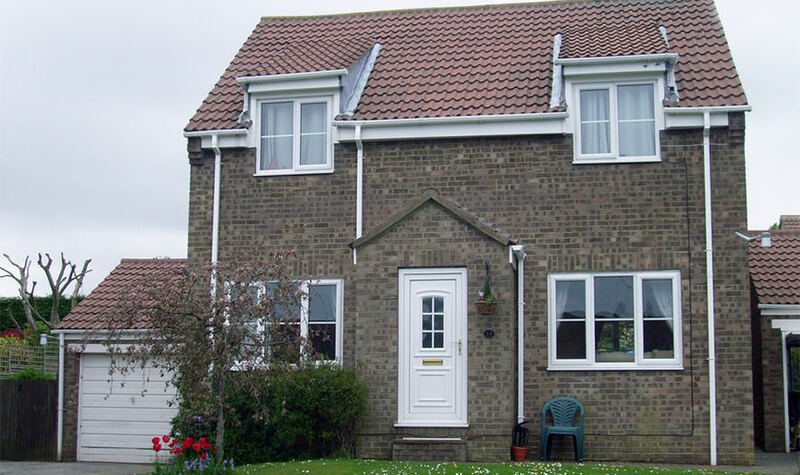 Our uPVC casement windows are the perfect choice for Eastleigh homes when it comes to efficiency, security and style. They are so versatile, it is easy to see why they are so sought after! Our Duraflex uPVC casement windows offer exceptional quality and impressive performance, which is why we are so proud to offer them to Eastleigh customers for their home improvements. We also offer a range of accessories and hardware to complete the look of your uPVC casement windows, as well as beautiful and practical decorative glazing. 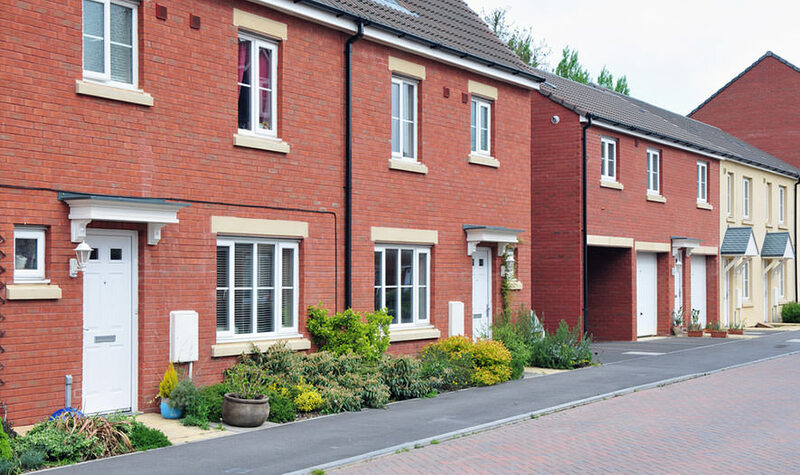 Modern uPVC casement windows are required to achieve the minimum standards in thermal performance set by Building Regulations , and our uPVC casement windows in Eastleigh are no exception. In fact, with uPVC casement windows from Advanced Exterior Plastics, you will benefit from the highest thermal performance possible. Our uPVC casement windows from Duraflex are so incredibly energy efficient, that they exceed the standards set! Your home will be warmer for longer with new uPVC casement windows from us, as they will retain the heating that you use. This will even help lower your energy bills, as with more warmth being retained for longer, you will be able to use less heating to keep your home at a comfortable temperature. With our Duraflex uPVC casement windows, you will benefit from the most advanced weather proofing technology for your Eastleigh home. Our windows are constructed with Q-Lon weather seals which will protect your home from even the worst coastal weather. The sheathed composite gasket creates a weather seal that is impenetrable by torrential rain, gale force winds and even heavy snow. It also works to help maximise the thermal performance of our uPVC casement windows and to enhance the acoustic protection our uPVC casement windows offer. Home security is a priority when considering any home improvements, and with our uPVC casement windows, you access the superb benefits of exceptional security performance. Our uPVC casement windows are constructed to the very highest standards using quality materials to ensure that they are robust and durable. In addition to this, we fit our uPVC casement windows with state of the art locking systems to ensure maximum protection. With uPVC casement windows from Advanced Exterior Plastics, you can have complete confidence in their security performance, as our windows have been approved by Secured by Design [link], the police preferred specification. We have a friendly and professional team waiting to help you find your perfect uPVC casement windows. Get in touch today and we can give you a competitive quote and help you with finding the right casement windows for your Eastleigh home. We even offer easy access to our uPVC casement windows prices online , simply create the window for you from the options available and get a tailored cost! 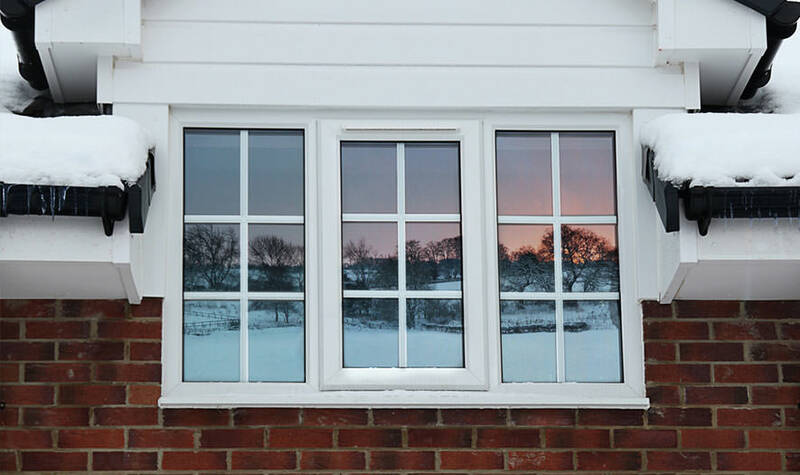 You could improve your Eastleigh home’s efficiency and security when you choose new double glazing. Our range of double glazed windows and doors offer exceptional thermal performance and are impressively secure. These superb double glazed windows and doors also look fantastic, offering a beautiful finish to your Eastleigh home. That’s right, double glazing from Advanced is high performance and provides a stunning aesthetic. All this comes at an affordable price that gives you a cost effective double glazing solution in Eastleigh. Read on to find out more about the fantastic range of windows and doors we can install in your home. The thermal performance of our quality double glazed windows and doors is so outstanding, it exceeds the requirements of Building Regulations. You can be confident that your home will perform better, retaining heat for longer, and enabling you to be more comfortable on cold days when you choose replacement double glazing from our range. Wherever you live in Eastleigh, security is an important deciding factor for your replacement double glazing. With our windows and doors, you can count on superb protection for your home. They are capable of attaining Secured by Design accreditation, the highest industry standard, and are fitted with the very latest locking mechanisms to keep your home safe. Our windows and doors are wonderfully secure, ensuring that you, and your family, in Eastleigh are protected. Here at Advanced, we ensure that we install only the very best double glazing into your Eastleigh home. That’s why we work with state of the art windows and doors from Duraflex. These high quality double glazing products are intelligently designed and provide the most innovative engineering and technology that you could need for your home. You will benefit from impressive quality, in materials used and construction, as well as design, when you choose Duraflex double glazing from Advanced. We aren’t like other double glazing installers, with a basic range of uPVC styles. We pride ourselves on giving our Eastleigh customers choice, so that they can find the perfect match for their home improvements. You might prefer our high quality uPVC windows and doors from Duraflex, as they can be customised with colours and finishes to completely complement the style of your home. However, we also offer a range of bespoke wooden windows and doors, for home owners who are looking for something a little different. Our high performance wooden double glazing is cleverly designed to offer you long term performance with minimal upkeep. It is thermally efficient and offers fantastic security. Each window and door in our wood range of double glazing is created to your exact specifications, giving you’re the ultimate bespoke finish. We’ve summarised the styles we offer so that you can get an overview of the extensive variety available. For more information on any of our double glazed windows and doors, please do get in touch. Sleek and timeless, these beautiful windows will suit any type of property, creating a stylish and tailored look. Designed to match the looks of period windows, our sash windows offer an authentic appearance which oozes character. Practical, yet pretty, tilt and turn windows are a versatile double glazing option that have many added benefits. Our bespoke wooden windows offer superb beauty and a unique finish for your Eastleigh home. Whether you require a front door or a back door, our extensive range of panel designs will provide you with a welcoming and stylish entrance to your home. Offering an authentic timber look, our composite doors are a stunning choice for any property, and are exceptionally strong and durable. Elegant style with a European flair will be yours when you choose uPVC French doors to open into your garden or onto your balcony. Enjoy extended views of your outside space as well as improved natural light entering your home when you choose our beautiful patio doors. For a luxurious entrance to your garden that creates a breath taking wall of glass, uPVC bi-fold doors are the ultimate option for your home. The variety of wooden doors on offer is extensive, they will enhance your home with stunning style and elegance, adding character to your property. Of course, there is more information throughout our website on our double glazing products, but if you would prefer to speak to a member of our expert team, we’d love to hear from you. Or, start your online quote for doubleglazing in Eastleigh now.